make advance reservations since others have discovered our piece of paradise." 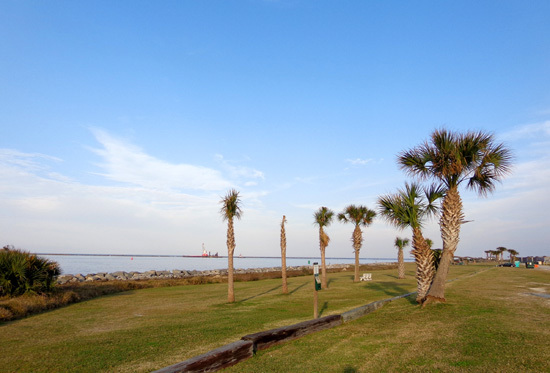 We're glad that we've now discovered this "piece of paradise" in the Jacksonville, Florida area, too. It's one of the nicest military campgrounds where we've ever stayed. Jim found it while researching southeastern Fam Camps online. We made reservations for the last week of January here at Mayport, and the whole month of February a few miles north at Kings Bay Submarine Base. you can see several speed boats near Huguenot Park on the north side of the river. 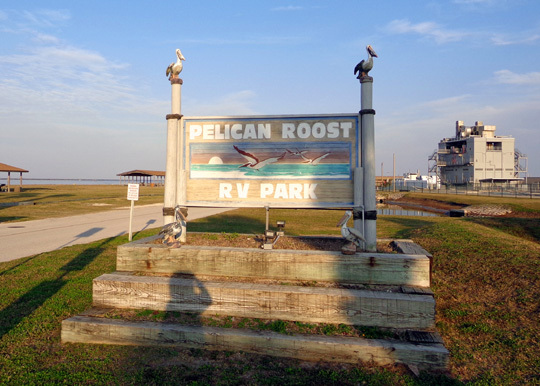 While in Savannah we heard such great reviews of Pelican Roost from other RVers that we called to also reserve a space for the first two weeks in March before even seeing this place. We think that's a good decision because this campground has so much to offer. Unfortunately, reservations are limited to two weeks at a time but that gives more people the opportunity to enjoy this beautiful RV park. Fortunately, if there is a spot available at the end of the two weeks, folks can extend one to seven more days. That usually doesn't happen in the winter, however, because the place stays full most days. 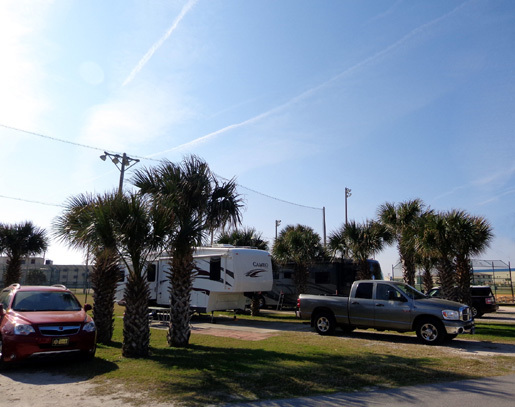 There is also a long-term campground at Mayport but it's hard to get in for the whole winter unless you reserve a spot to begin in October or November. I'll talk about it later in this entry. 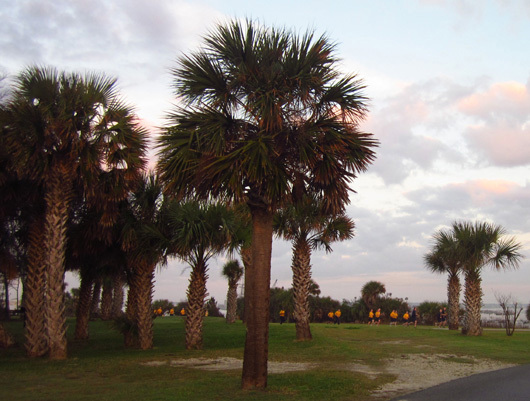 We had a relatively short drive from Hunter Army Airfield in Savannah to Pelican Roost RV Park. 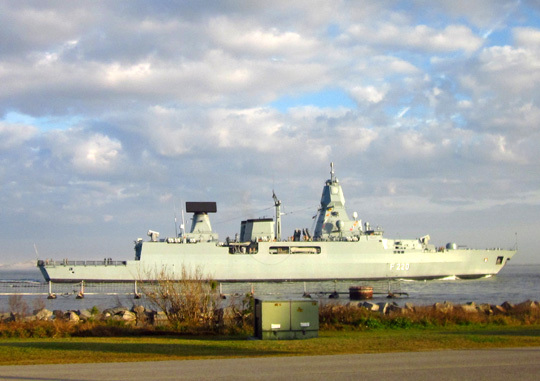 Our GPS correctly directed us to the main gate at the Mayport Naval Station, which is one of three Navy installations in the Jacksonville area. 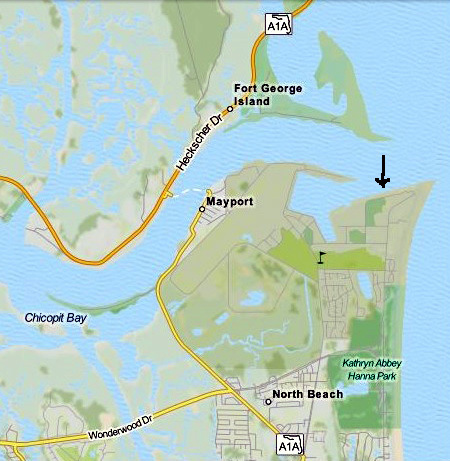 The campground, under the arrow I drew on the map section above, is in a great location next to the river -- with a front-seat view of Navy and private ships coming and going -- and a 1/3-mile walk to the Atlantic beach. The Navy bases in Jacksonville require RVers and other repeat visitors to get a decal on their first visit. In addition to filling out a lengthy form at the office near the gate, you need military ID, proof of insurance, and vehicle registration. It's a bit of a hassle initially but the decal is good for entry to all three of these Navy bases for the next five years. I believe this is the first time we've had to apply for a decal on a military base. Guards still check ID each time we re-enter the base. The building to the right is for fire fighter training -- very interesting to watch! It was much easier to find this campground than some at other military installations. We arrived at the RV park just after 2 PM and got checked in efficiently by the efficient MWR staff on duty. It's very handy to have one or more MWR employees stationed right in the campground on weekdays so you can pay there, extend reservations, ask questions, etc. At most other FamCamps where we've stayed, MWR is in a building up to several miles away and we have to go there to pay our campground fee. 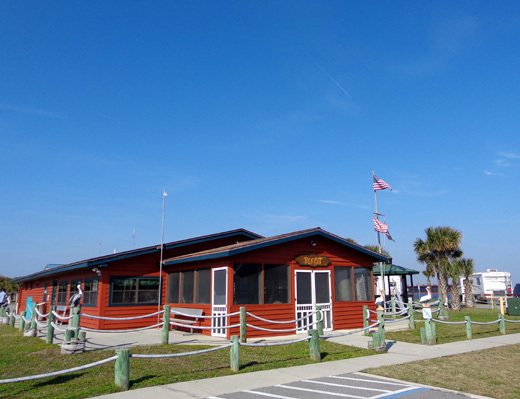 At Pelican Roost there is another MWR building on base that handles all the other recreational activities like renting boats, campers, and equipment. 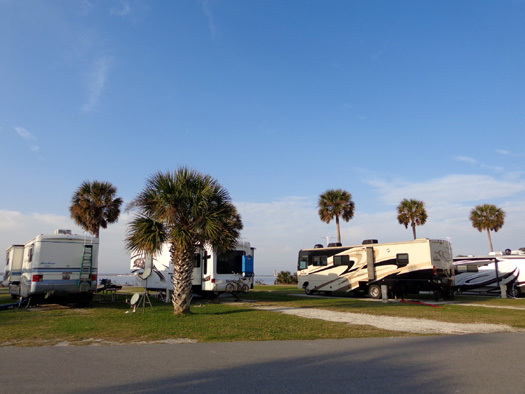 In addition to the MWR staff at Pelican Roost there are also two amiable campground host couples that rotate duties during the evening and on weekends. This RV park has 49 well-spaced campsites with full hookups and additional overflow sites with no hookups on grass at the rear of the campground. There is also a designated tent camping area. 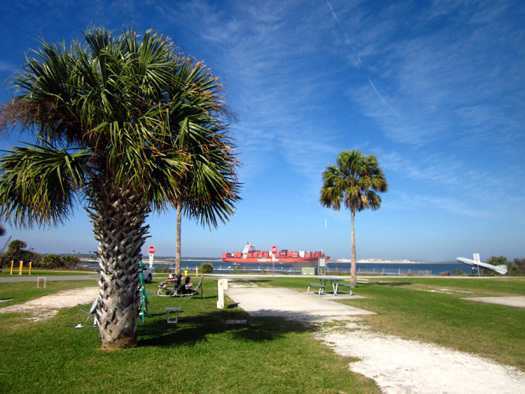 The prime spots are the 19 pull-thru waterfront sites, which are about 100 feet from the wide St. Johns River channel. The sites are about 100 feet long. 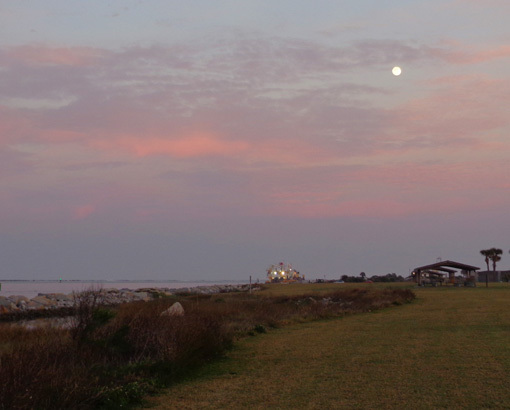 A paved road, a linear, grassy Dolphin Run Park, and a low wall of rip-rap are all that separate these campsites from a perfect view of all the ships passing by. 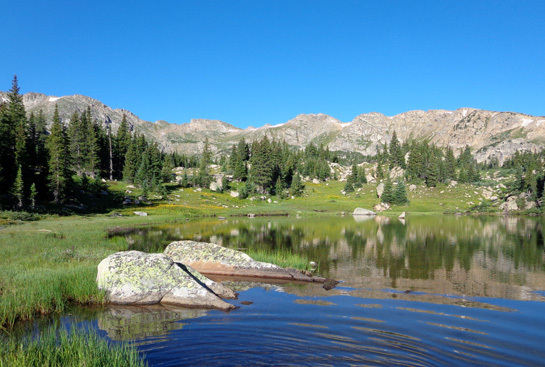 These sites are particularly good for people with motorhomes because their large windshields face the water. Although 5th-wheel and travel trailers have fewer windows on the front (that's usually their sleeping quarters), you can still get good views of the river from side windows in the waterfront sites. One guy pulled his 5th-wheel in the wrong way so his back bay windows faced the water but he was quickly told to turn around the proper direction. The reason given was safety in case of a hurricane evacuation. The major downside to the waterfront sites is the wind. The sites in the back row and a half may not have as good views but they are more protected. 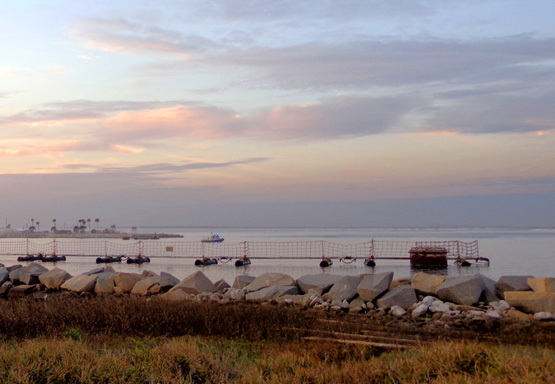 A second and partial third tier of back-in sites lie behind the waterfront sites. They are not as long as the front row but most of them have as much space between sites. Some of the second-row sites have unobstructed views of the river. When we made our reservations we asked about a waterfront site but they were all reserved for our time period (unless we wanted to move a few times!). We like our site. It has a large concrete pad and about 20 feet of grass on either side between us and our neighbors. We have some nice palm trees on our site and a picnic table. The only downside is the noise and bright lights from the ball field complex right behind us (with a tall chain link fence and high protective netting). Sailors are often out there doing noisy calisthenics before daylight. campground and river. We get some beautiful sunrises and sunsets here. So what does a site cost in this little slice of paradise? It's $21/day for waterfront sites and $19/day for the back-in sites. That includes water, electricity, sewer, cable, and free WiFi, which is not the greatest. Our Verizon cell phones and MiFi internet connections work fine, though. There are no weekly rates or refunds and people must cancel their reservations 14 days in advance or be charged one night's fee -- that's the most strict cancellation/refund policy we've found at military campgrounds so far. You can't beat this RV park for entertainment. 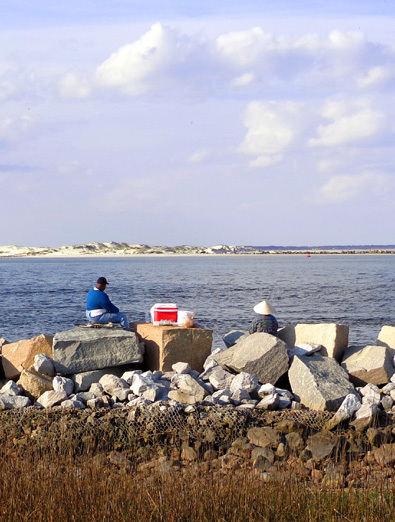 In addition to all the Navy vessels, commercial ships, fishing boats, and recreational watercraft that you can see from the campground, there are also lots of fishermen, other people, feral cats, dogs, migratory and resident birds, and dolphins to watch. we've got a great view when one or more of the sites in front of us are empty! 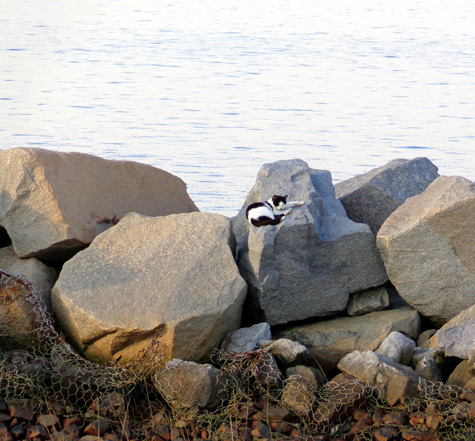 We haven't seen pelicans close to the campground but there are lots of them on the rocks (jetty) closer to the mouth of the river channel. I'll show photos of them in the next entry, which focuses on the beach. We don't have to go very far to walk along the scenic river. 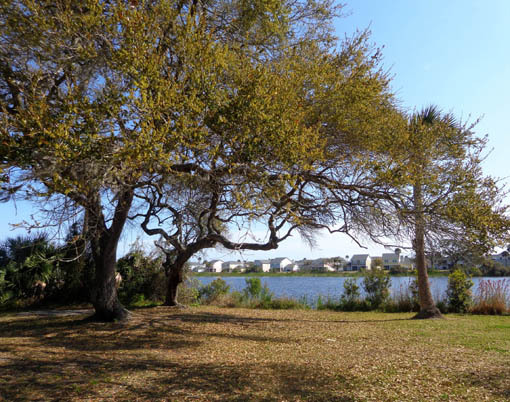 We're about 100 feet from grassy Dolphin Run Park and 175 feet from the St. Johns River. RVers are asked to walk their dogs at the park so we're over there often to let Cody and Casey do their business. At five months of age Casey has to pee fairly frequently . . . Multiple daily trips across the road to the grassy area are no problem. 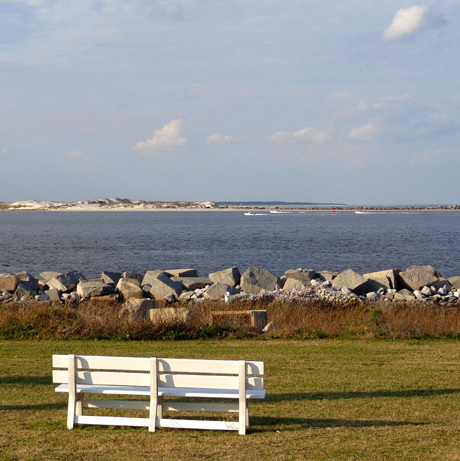 The weather has been good and it's great fun to see the tide go in and out, watch all the activity on and near the water, and enjoy the scenic beach-and-dune views across the channel at Huguenot Park. All the nearby ships don't seem to bother them. This couple is out there fishing every morning. They also come into the campground looking for food. Unfortunately, some campers feed them. That's a no-no. One of the other campers told me there used to be about 200 cats hanging out until Animal Control, um, "controlled" them. Casey-pup really wants to meet those cats! Cody learned long ago not to mess with cats. I've never seen so many kinds of boats and ships in one place before. It fascinates the heck out of me to watch them come and go. 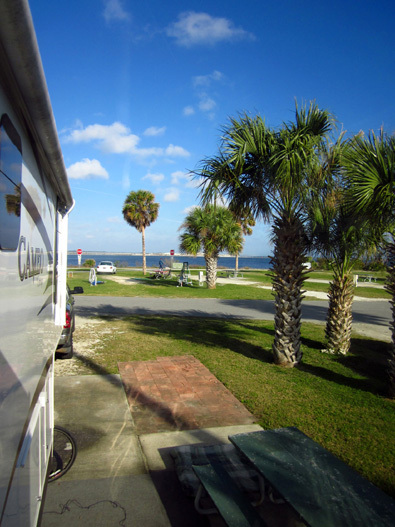 Pelican Roost RV Park is situated about half a mile upstream (west) of the mouth of the St. Johns River into the Atlantic Ocean. 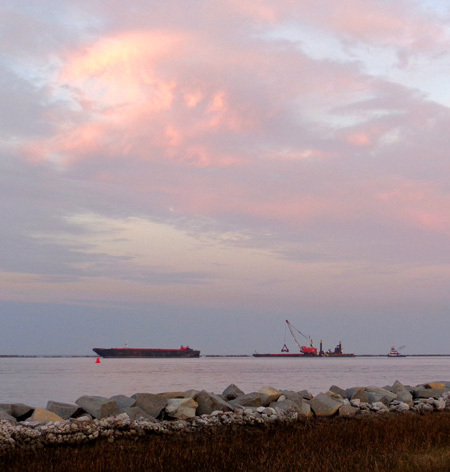 Sunrise brightens the Navy shipyard at high tide. The gate is closed in this picture. It's fun to walk across the grassy strip toward the water and watch the Coast Guard boats guarding the entry "gate" to the shipyard. a Coast Guard boat is patrolling the water with its lights on. What a variety of ships come in and out! They aren't just American, either. We can also see the ships from the roads inside the base on three sides of the large ship yard. Jim likes to ride his bike over there and he took me in the truck to see them one day. 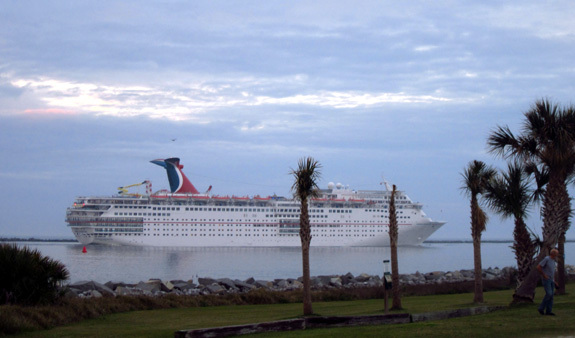 The ship yard can accommodate almost three dozen ships at one time. 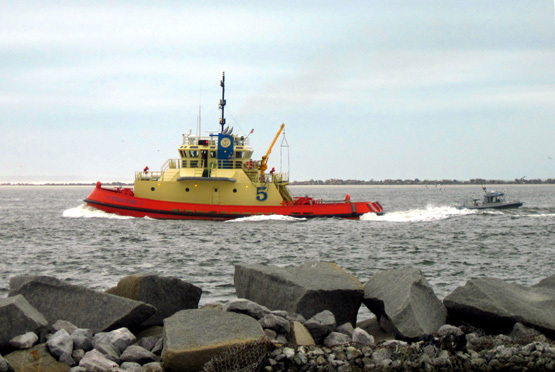 There is also quite a variety of recreational boats (sailboats and motorboats) and commercial ships (cruise ships, container ships, barges, ships hauling hundreds of cars, shrimp boats, etc.) plying the water on the north side of the river channel, heading to points closer to downtown Jacksonville. We hear lots of helicopters flying to and from the base, too, but there are fewer aircraft here than at the Air Force bases or Army airfields where we've stayed. 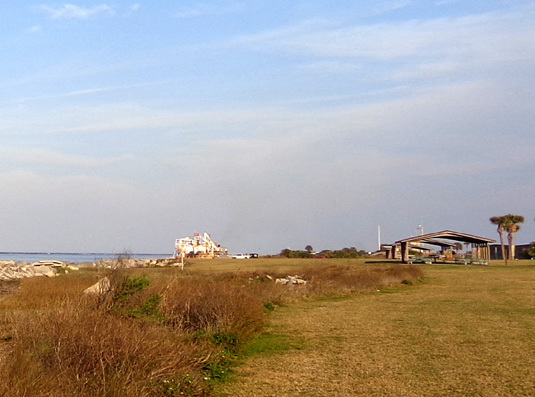 This base has an airfield with one 8,000-foot runway. 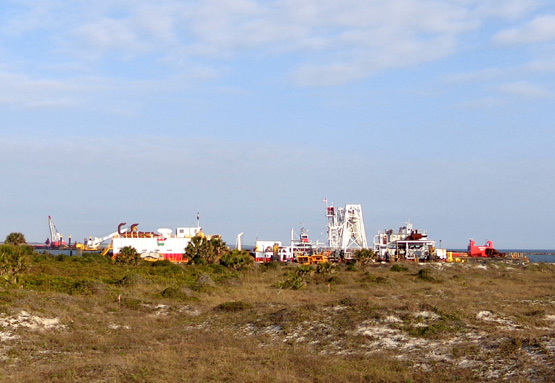 A larger naval air station is about 25 air miles from Mayport, at the southern end of Jacksonville. We've been so fascinated with the various ships coming in and out that we've looked online to determine the types and names of some of them. 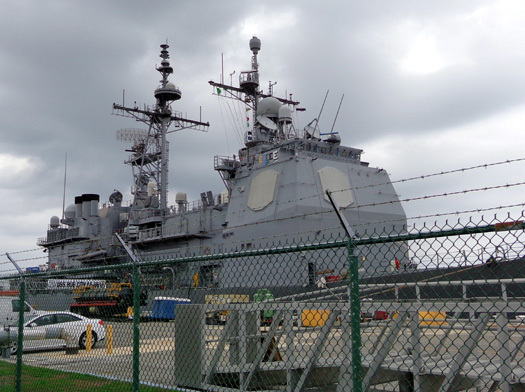 This Wikipedia article has a more complete list of the frigates, cruisers, destroyers, amphibious docks, and other ships based at Mayport. 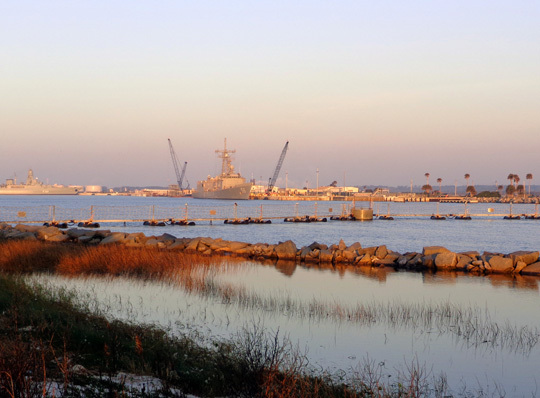 In 2009 Congress approved legislation to upgrade the Mayport Naval Station so it can accommodate one or more nuclear aircraft carriers and the ships that support them. Currently the only such carriers on the east coast are based at Norfolk, VA, leaving the country more vulnerable to nuclear attack than if they were located in more than one place. 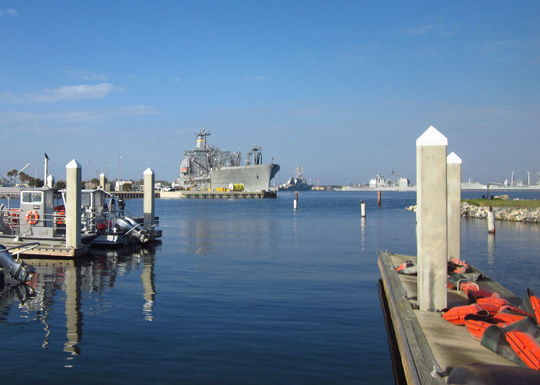 Moving one or more carriers to Mayport involves some major personnel and infrastructure changes, including making the ship yard more accessible to such large ships. 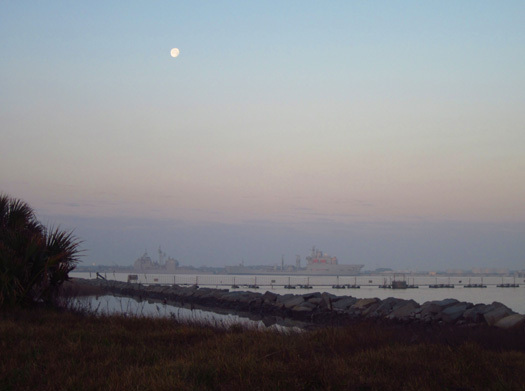 Ship yard at sunrise; the moon is setting in the west. 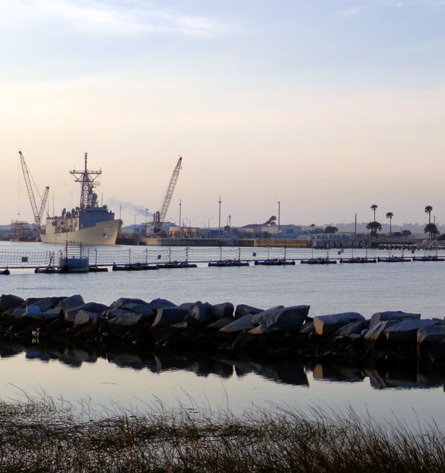 This winter the busy St. Johns River channel is being dredged around the clock until the water is deep enough to accommodate several large Navy ships from Norfolk that will be coming in later this year and next. Sand and small rocks continually fill in the channel from the ocean tides so this is a periodic endeavor that must be taken. The Weeks Marine base of operations for the dredging is lit up all night. 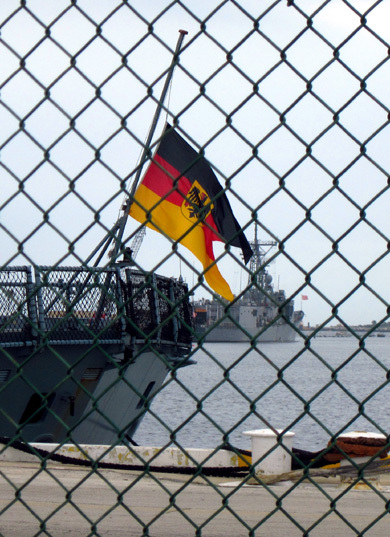 It is stationed on the south (Navy base) side of the river. When enough sand has been collected the company doing this extensive job -- Weeks Marine -- will fill in the beach on the east side of the Naval Station from the river jetty to the south boundary of the base at Hanna Park, a distance of about 1� miles. That phase of the project hasn't begun yet. 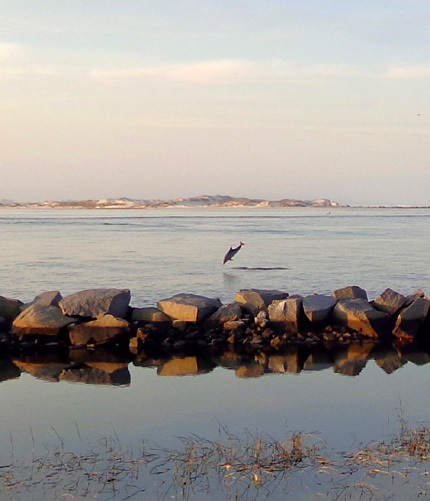 I'll include photos in the next entry that show how narrow that beach is during high tide. It's just about ready to erode the dunes. The upside of this project is being able to watch the dredging machinery on both sides of the river. The downside is some noise, but we don't hear it inside our camper and it's not too annoying when we're outside in the park next to the river. 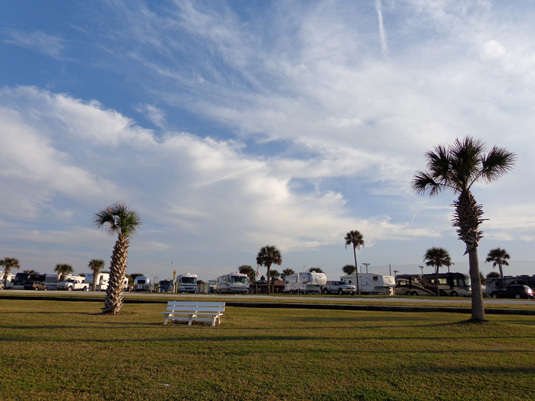 In the busy winter months snowbirds can usually stay only a max of fourteen days at Pelican Roost RV Park. 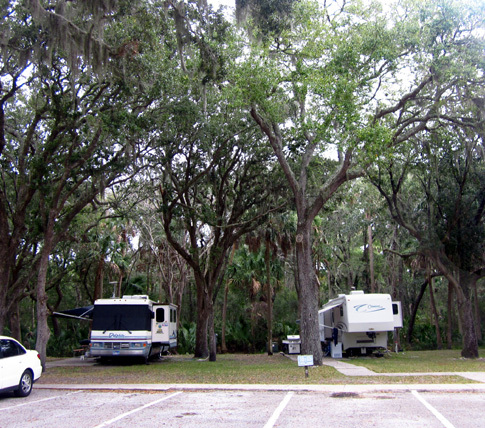 Longer-term visitors can stay at a second RV park on base, Osprey Cove, on the south side of the base. We've ridden our bikes over to Osprey Cove several times. The sites are fairly large but some look difficult to back in a large 5th-wheel or travel trailer because they must go up and over curbs, as in the photo above. There are 50 full hookup sites that cost $18/day. I don't believe there is a monthly rate. 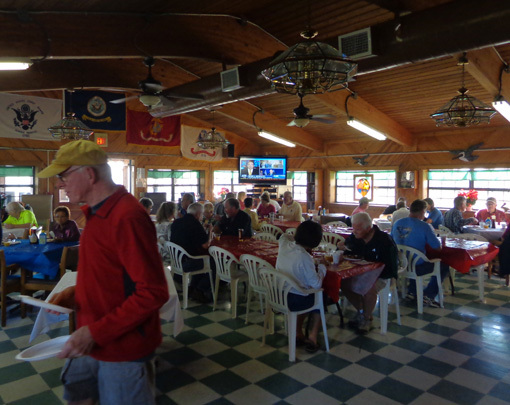 Pelican Roost and Osprey Cove RV Parks share the same activity calendar, including ice cream socials every Saturday night and a pancake breakfast every other Saturday morning. Potluck suppers, holiday parties, trips to restaurants in Jacksonville, arts and crafts sales, and other activities are also planned each month for those who are interested. The arts and crafts sale that day was very small. It featured a couple RVers who make jewelry and wood products and a man who was selling honey products from the bees he keeps at his home in Virginia. Near this building is a separate laundry room with several washers and dryers that are free for campers to use. Usually military campgrounds have washers and dryers that are less expensive than those off-base but we don't often run into FamCamps where the machines are free. I know the cost is embedded in the campground fee but with as much laundry as we do, it's very cost-effective for us. 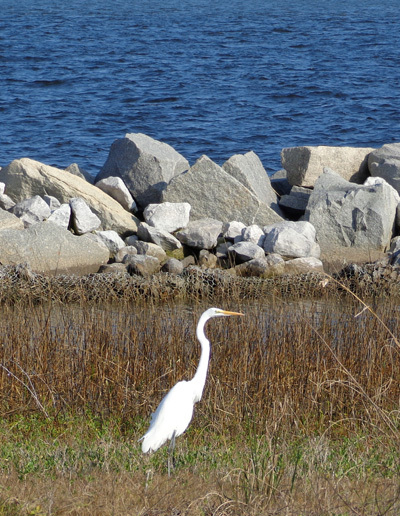 We've seen lots of beautiful herons and egrets between the river and campground. A minor downside to camping at Mayport Naval Station is not having a BX or commissary on base. They are located two or three miles south of the main gate on Route AIA. I think this is the first time we've camped at a military installation where the BX/NEX/PX and commissary are off-base. There are many more positives to staying at this base than negatives, however. The high occupancy rates at both campgrounds in the winter are testament to their popularity with snow-birding retirees.